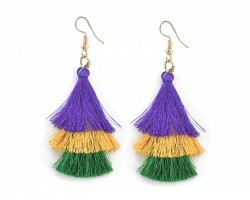 Mardi Gras Chandelier Pearl Tassel Hook Earrings. Three cloth dangle tassels in a chandelier style. Pearl Mardi Gras colors: purple, green and gold. Hook style. 2 inches long.